Successes in lowering maternal and child mortality rates and introducing effective vaccination programs have made Sri Lanka’s low-cost model one worth emulating in the rest of South Asia. Fertility decline and increasing longevity have resulted in a demographic transition in Sri Lanka and this is taking place while the country is aspiring to become an upper middle-income country. Population projections show that the proportion of Sri Lankans above the age of 60 years will increase from 14 percent in 2017 to 22 percent by the year 2037. The report captures the findings of wide-ranging conversations among hundreds of stakeholders from every level of the country’s healthcare system. 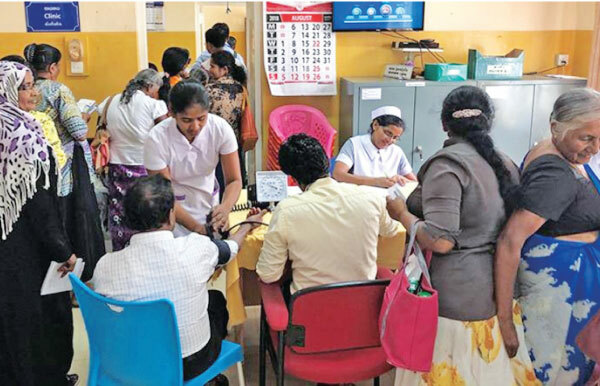 Facilitated by the Ministry of Health, Nutrition and Indigenous Medicine, and supported by the World Bank, the report makes a case for why, and how, Sri Lanka must re-imagine its primary healthcare systems in order to attain the goals of universal healthcare. Why focus on primary healthcare? In theory, any Sri Lankan can find a healthcare service provider within 5km – 10km of wherever they are. Yet, in practice, gaps in the quality of investigative services, a shortage of qualified personnel and some medications mean that people pass by such primary health care institutions and seek help at larger, tertiary care institutions instead. This is not ideal – in fact, as the Director General of Health Services, Dr. Anil Jasinghe notes, 70‐80% of all care should be delivered at the primary care level, with 10‐15% of care provided at the secondary level and only the most advanced cases treated at the tertiary level. This is of particular concern when it comes to treating non-communicable disease (NCDs) – in an aging population, NCDs can impede new progress and even reverse the gains made. As we pursue the vision of reliable and affordable universal healthcare for all, a re-haul of our primary healthcare system becomes essential. We have identified three general areas for action: re-organizing primary health care to meet Sri Lanka’s future needs; using data and information to improve people-centered service provision and strengthening the health sector. Tackling these challenges will require a complex and ambitious plan, with many moving parts. For instance, we could integrate prevention and treatment of service delivery for NCDs, including developing Healthy Life Centres and locating community-based NCD screening in Primary Medical Care Institutions (PMCIs). Another focus should be on improving the efficiency and reliability of supply chain management systems for pharmaceuticals and medical supplies. We will also have to continue to invest in and expand the country’s capacity of human resources for health, ensuring all providers have the skills, time and supplies necessary to provide quality, people-centered primary health care to Sri Lankans throughout their lives. These are only some of the measures that are being discussed, but they all hold the potential to save lives and improve the experiences of Sri Lankans in the moments when they are most vulnerable and in need of help. On January 23, 2019, the Government of Sri Lanka and the World Bank signed a $200 million loan agreement to help increase the use and quality of Sri Lanka’s primary healthcare services. By rising to the challenge today, Sri Lanka can ensure it remains a model of how to provide healthcare for all its citizens in a way that is effective, affordable, accessible and above all, humane.